Habitat loss and hunting have forced Madagascar’s iconic lemurs towards the limits of their existence. And now the political unrest in the country is putting even greater threat on these rare animals. To combat this, a collaboration of leading primatologists and conservationists have devised a 3 year action plan which provides a life line for these charismatic animals. Lemurs are native and endemic to the Island of Madagascar, which is situated in the Indian Ocean off the south east coast of Africa. To date, there have been 101 species of lemur identified, making up about a fifth of all the world’s primate species. This is set to rise as more lemur species are still being discovered. However, 90 species are now listed as threatened on the IUCN’s red list, and populations are showing rapid declines all across Madagascar. One of the major problems is that human numbers are increasing. To accommodate this greater need for food, jobs and housing; the local people use devastating slash-and-burn techniques to quickly remove large areas of forest to make room for mining and agriculture activities and to build new settlements. Now only 10-20% of the original forest remains. On top of this, many lemurs are taken from the wild to be kept as pets, and the bush-meat trade has also skyrocketed; more lemurs are being hunted to feed the increasing Madagascan population. 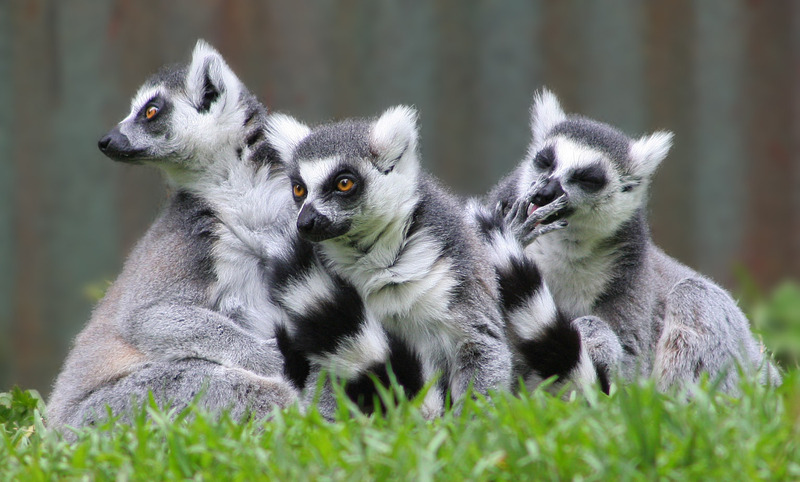 Lemurs are vitally important to both Madagascar’s environment and their economy. By dispersing seeds and pollinating plants they act as a keystone species improving the health of the ecosystem they live in. And being such an iconic species, they provide economic benefits to local communities by drawing in tourists and their money. The value of conserving lemurs is well known, they are highly protected against trade and hunting bans are in place in many parts of the country, but this alone is not enough. Promote eco-tourism and global awareness. “If we don’t act now we would start to loose species of lemur for the first time since records began, and this would likely result in a loss of many other species. Past successes have shown that when researchers work together with the local community and NGO’s, they can protect endangered primates. The importance of the proposed action plan cannot be exaggerated”. Madagascar’s political instability has been a major issue for five-years, and since the unrest started environmental programs have lost financial backing from international donors. However, the researchers’ hopes were raised on the 25th of January when President Rajaonarimampianina was democratically-elected into power. He has offered his support to efforts to reduce the exploitation of Madagascar’s natural resources and agreed that the country’s biodiversity and the ecotourism it promotes, is vital for poverty alleviation and the well-being of his people. “Despite the political crisis and the intense threats faced by the lemurs, we believe there is still hope. It seems that the new president will resume an effective governance, and once again promote international aid”. With the new government showing such positive support it seems that although ambitious, the action plan is achievable. Looking to the future the authors have urged international stakeholders to contribute to the action plan in order to make it a success. Although only a glimmer, there is still hope for the continued existence of even the most endangered species of lemur. Previous ArticleWhat’s brown but not as sticky as you might think?